Costing $617 million, the CGRO was part of NASA's "Great Observatories" series, along with the Hubble Space Telescope, the Chandra X-ray Observatory, and the Spitzer Space Telescope. 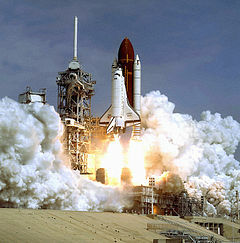 It was the second of the series to be launched into space, following the Hubble Space Telescope. CGRO was named after Arthur Holly Compton (Washington University in St. Louis), Nobel prize winner, for work involved with gamma ray physics. CGRO was built by TRW (now Northrop Grumman Aerospace Systems) in Redondo Beach, California. CGRO was an international collaboration and additional contributions came from the European Space Agency and various universities, as well as the U.S. Naval Research Laboratory. Successors to CGRO include the ESA INTEGRAL spacecraft (launched 2002), NASA's Swift Gamma-Ray Burst Mission (launched 2004) and NASA's Fermi Gamma-ray Space Telescope (launched 2008); all three remain operational as of 2017. The Burst and Transient Source Experiment, (BATSE) by NASA's Marshall Space Flight Center searched the sky for gamma ray bursts (20 to >600 keV) and conducted full sky surveys for long-lived sources. It consisted of eight identical detector modules, one at each of the satellite's corners. Each module consisted of both a NaI(Tl) Large Area Detector (LAD) covering the 20 keV to ~2 MeV range, 50.48 cm in dia by 1.27 cm thick, and a 12.7 cm dia by 7.62 cm thick NaI Spectroscopy Detector, which extended the upper energy range to 8 MeV, all surrounded by a plastic scintillator in active anti-coincidence to veto the large background rates due to cosmic rays and trapped radiation. Sudden increases in the LAD rates triggered a high-speed data storage mode, the details of the burst being read out to telemetry later. Bursts were typically detected at rates of roughly one per day over the 9-year CGRO mission. A strong burst could result in the observation of many thousands of gamma rays within a time interval ranging from ~0.1 s up to about 100 s.
The Oriented Scintillation Spectrometer Experiment, (OSSE), by the Naval Research Laboratory detected gamma rays entering the field of view of any of four detector modules, which could be pointed individually, and were effective in the 0.05 to 10 MeV range. Each detector had a central scintillation spectrometer crystal of NaI(Tl) 12 in (303 mm) in diameter, by 4 in (102 mm) thick, optically coupled at the rear to a 3 in (76.2 mm) thick CsI(Na) crystal of similar diameter, viewed by seven photomultiplier tubes, operated as a phoswich: i.e., particle and gamma-ray events from the rear produced slow-rise time (~1 μs) pulses, which could be electronically distinguished from pure NaI events from the front, which produced faster (~0.25 μs) pulses. Thus the CsI backing crystal acted as an active anticoincidence shield, vetoing events from the rear. A further barrel-shaped CsI shield, also in electronic anticoincidence, surrounded the central detector on the sides and provided coarse collimation, rejecting gamma rays and charged particles from the sides or most of the forward field-of-view (FOV). A finer level of angular collimation was provided by a tungsten slat collimator grid within the outer CsI barrel, which collimated the response to a 3.8° x 11.4° FWHM rectangular FOV. A plastic scintillator across the front of each module vetoed charged particles entering from the front. The four detectors were typically operated in pairs of two. During a gamma-ray source observation, one detector would take observations of the source, while the other would slew slightly off source to measure the background levels. The two detectors would routinely switch roles, allowing for more accurate measurements of both the source and background. The instruments could slew with a speed of approximately 2 degrees per second. The Imaging Compton Telescope, (COMPTEL) by the Max Planck Institute for Extraterrestrial Physics, the University of New Hampshire, Netherlands Institute for Space Research, and ESA's Astrophysics Division was tuned to the 0.75-30 MeV energy range and determined the angle of arrival of photons to within a degree and the energy to within five percent at higher energies. The instrument had a field of view of one steradian. For cosmic gamma-ray events, the experiment required two nearly simultaneous interactions, in a set of front and rear scintillators. Gamma rays would Compton scatter in a forward detector module, where the interaction energy E1, given to the recoil electron was measured, while the Compton scattered photon would then be caught in one of a second layer of scintillators to the rear, where its total energy, E2, would be measured. From these two energies, E1 and E2, the Compton scattering angle, angle θ, can be determined, along with the total energy, E1 + E2, of the incident photon. The positions of the interactions, in both the front and rear scintillators, was also measured. The vector, V, connecting the two interaction points determined a direction to the sky, and the angle θ about this direction, defined a cone about V on which the source of the photon must lie, and a corresponding "event circle" on the sky. Because of the requirement for a near coincidence between the two interactions, with the correct delay of a few nanoseconds, most modes of background production were strongly suppressed. From the collection of many event energies and event circles, a map of the positions of sources, along with their photon fluxes and spectra, could be determined. The Energetic Gamma Ray Experiment Telescope, (EGRET) measured high energy (20 MeV to 30 GeV) gamma ray source positions to a fraction of a degree and photon energy to within 15 percent. EGRET was developed by NASA Goddard Space Flight Center, the Max Planck Institute for Extraterrestrial Physics, and Stanford University. Its detector operated on the principle of electron-positron pair production from high energy photons interacting in the detector. The tracks of the high-energy electron and positron created were measured within the detector volume, and the axis of the V of the two emerging particles projected to the sky. Finally, their total energy was measured in a large calorimeter scintillation detector at the rear of the instrument. The EGRET instrument conducted the first all sky survey above 100 MeV. Using four years of data it discovered 271 sources, 170 of which were unidentified. Al (a radioactive isotope of aluminum). The OSSE instrument completed the most comprehensive survey of the galactic center, and discovered a possible antimatter "cloud" above the center. The BATSE instrument averaged one gamma ray burst event detection per day for a total of approximately 2700 detections. It definitively showed that the majority of gamma-ray bursts must originate in distant galaxies, not nearby in our own Milky Way, and therefore must be enormously energetic. The separation of GRBs into two time profiles: short duration GRBs that last less than 2 seconds, and long duration GRBs that last longer than this. Gamma ray burst 990123 (23 January 1999) was one of the brightest bursts recorded at the time, and was the first GRB with an optical afterglow observed during the prompt gamma ray emission (a reverse shock flash). This allowed astronomers to measure a redshift of 1.6 and a distance of 3.2 Gpc. Combining the measured energy of the burst in gamma-rays and the distance, the total emitted energy assuming an isotropic explosion could be deduced and resulted in the direct conversion of approximately two solar masses into energy. This finally convinced the community that GRB afterglows resulted from highly collimated explosions, which strongly reduced the needed energy budget. After one of its three gyroscopes failed in December 1999, the observatory was deliberately de-orbited. At the time, the observatory was still operational; however the failure of another gyroscope would have made de-orbiting much more difficult and dangerous. With some controversy, NASA decided in the interest of public safety that a controlled crash into an ocean was preferable to letting the craft come down on its own at random. 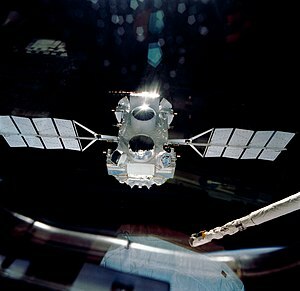 Unlike the Hubble Space Telescope or the International Space Station, it was not designed for on-orbit repair and refurbishment. It entered the Earth's atmosphere on 4 June 2000, with the debris that did not burn up ("six 1,800-pound aluminum I-beams and parts made of titanium, including more than 5,000 bolts") falling into the Pacific Ocean. ^ "NASA - NSSDCA - Spacecraft - Details". nssdc.gsfc.nasa.gov. Retrieved 2018-04-30. ^ "Gamma-Ray Astronomy in the Compton Era: The Instruments". Gamma-Ray Astronomy in the Compton Era. NASA/ GSFC. Retrieved 2007-12-07. ^ "Entry Debris Field estimation methods and application to Compton Gamma Ray Observatory" (PDF). Mission Operations Directorate Nasa Johnson Space Center. Wikimedia Commons has media related to Compton Gamma Ray Observatory.